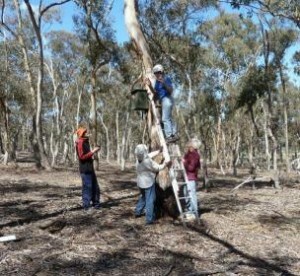 Landcare volunteers regularly monitor nest boxes located on public and private land. 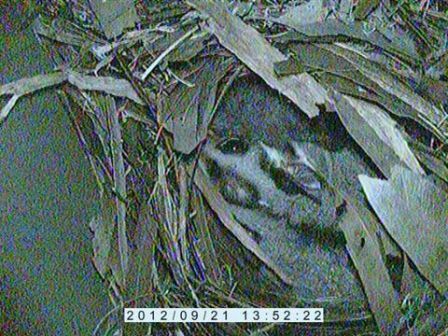 It is hoped that the boxes will provide much needed habitat for many of the vulnerable species found in the area like tuans (brush-tailed phascogales), sugar gliders, squirrel gliders and ringtail possums. These creatures depend on tree hollows for safe nesting sites and so have lost habitat due to clearing for farming and residential purposes. Traditionally, monitoring has been done by climbing up ladders and peeping in (as in our top picture). However our group has now purchased cameras which can be mounted on a pole and fed into the boxes. This is less invasive for the inhabitants and less precarious for volunteers! Here is a photo of what looks like a sugar glider taken with one of these cameras.